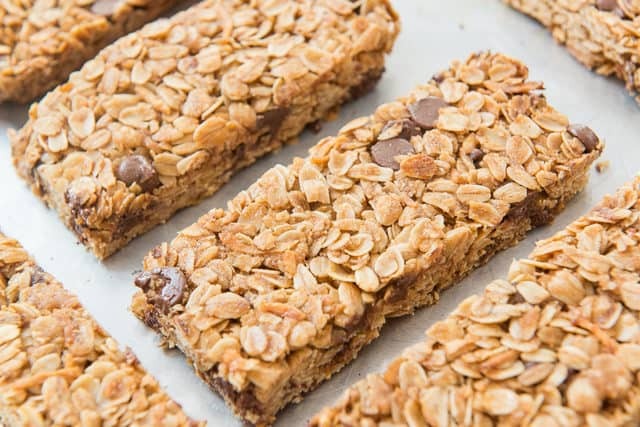 These homemade Chocolate Chip Granola Bars are a delicious lunchbox or afternoon treat, and are a cinch to make. 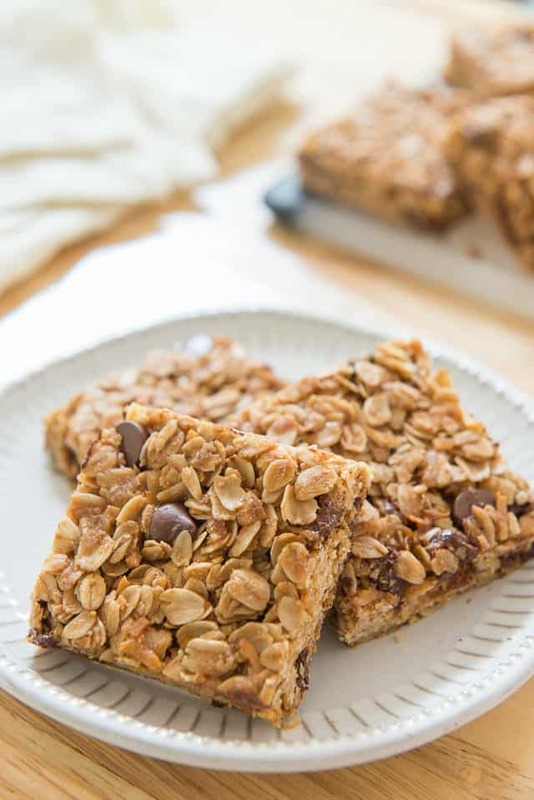 They’re better than store-bought granola bars! Raise your hand if you ate granola bars as a kid. I probably ate hundreds of them in my grade school years. You know, the ones that were Cookies & Cream, S’mores, and Peanut Butter flavored, that were delicious but also full of corn syrup and preservatives! 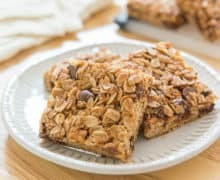 Today’s recipe is an adult-friendly and kid-friendly granola bar, but made with old-fashioned oats, whole wheat flour, unsweetened coconut, honey, and other upgrades from the store-bought bars. This bar is definitely a treat, but a very nostalgic one that’s crunchy, flavorful, and hearty. They’re also very easy to make, basically just a “mix and bake” type of recipe. This recipe is from my friend Catherine’s cookbook Weelicious Lunches. 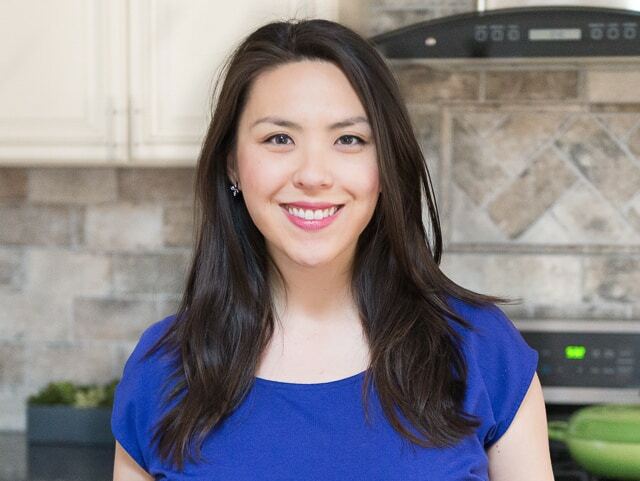 Catherine is such a great resource for kid-friendly recipes, and does a lot of fresh fruit and vegetable focused food on her channels. Go check her out for some new healthy ideas! I like to use olive oil, avocado oil, or melted coconut oil, but any neutral oil works. 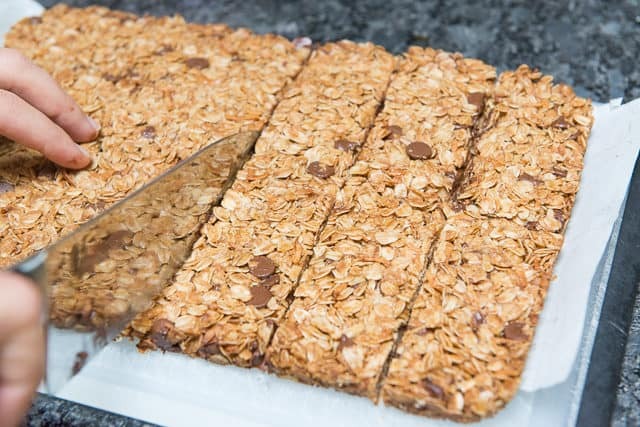 Make sure to really compact it down into all the edges, which will help the granola bars hold together better. You can do rectangular bars or squares, it’s up to you! Here’s my favorite Granola Recipe for loose, cluster granola instead of bars, that’s great for sprinkling over yogurt or snacking. The full recipe is below, plus a video of the process below the recipe card. Enjoy! 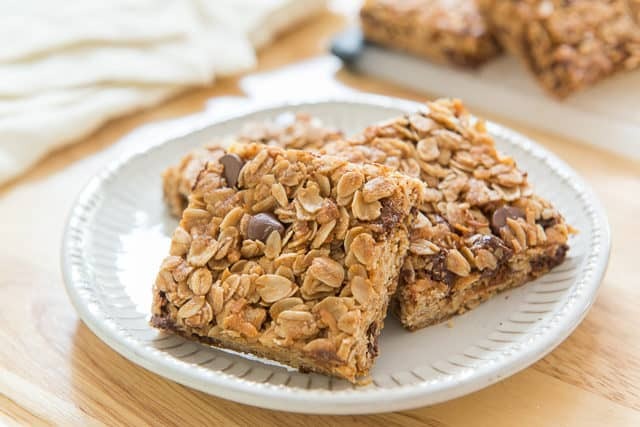 These homemade Chocolate Chip Granola Bars are the perfect treat to pack in your lunchbox or enjoy as an afternoon snack! Preheat the oven to 325 degrees F. Line a quarter sheet pan with parchment paper. 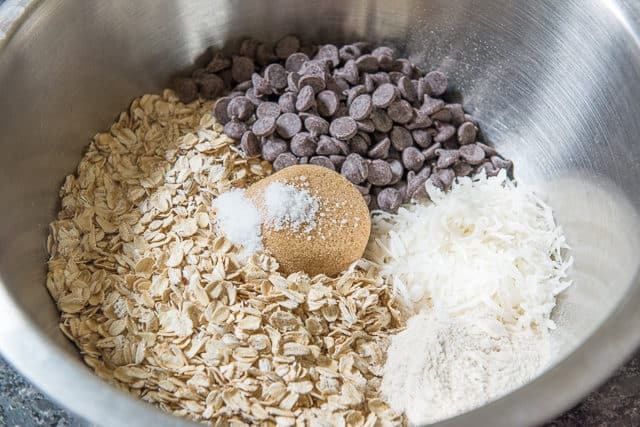 Place the oats, flour, coconut, brown sugar, chocolate chips, and salt in a large bowl, and toss it all around with a spatula until combined. In another bowl, whisk together the oil, vanilla, and honey until smooth and combined. 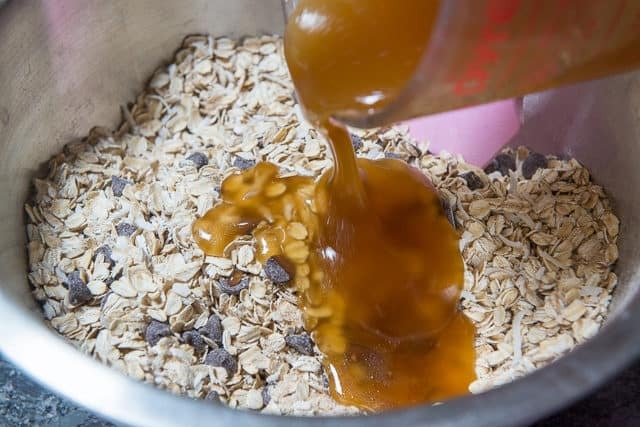 Pour this all over the dry ingredients, and toss all the ingredients together until the wet ingredients have evenly coated all of the oats. Press the granola mixture into the pan, really compacting it well. 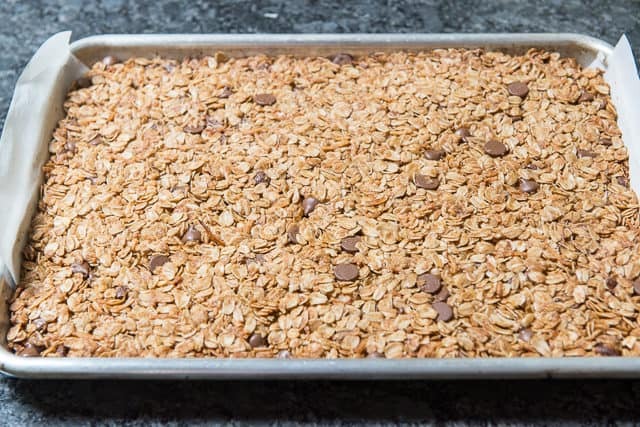 Bake the granola rectangle for about 35 minutes, until it’s golden and dry to the touch. 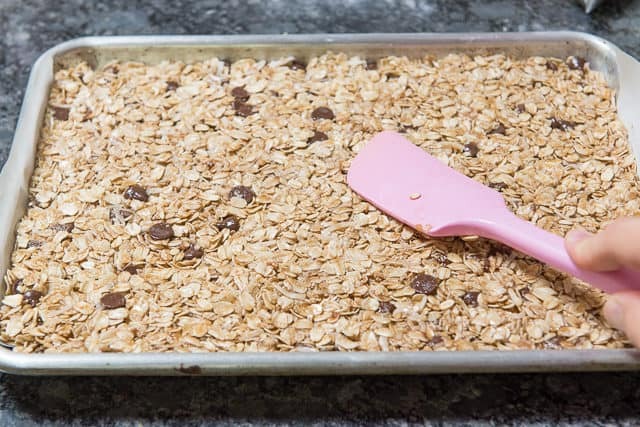 Cool the granola on the baking sheet for at least 10 minutes, then cut into small bars with a really sharp knife. *I use olive oil, avocado oil, or coconut oil (melt before using), but any neutral oil works. Catherine's recipe uses canola oil. Disclosure: Catherine sent me a review copy of her book. This post contains an affiliate link. Post updated in July 2018 with new photos, writing, and tips. Originally published in September 2013. Love these bars! Such a wholesome homemade treat. My brother and I did this, it was delicious! It’s a really simple recipe. Hi Salma, that’s so nice you did some baking with your brother. Glad you enjoyed. What could you use in place of coconut flakes? Hi Jessica, you can leave them out.